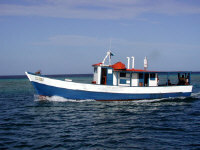 Tourism is the mainstay of the small, open Aruban economy, with offshore banking and oil refining and storage also important. The rapid growth of the tourism sector over the last decade has resulted in a substantial expansion of other activities. Over 1.5 million tourists per year visit Aruba, with 75% of those from the US. Construction continues to boom, with hotel capacity five times the 1985 level. In addition, the country's oil refinery reopened in 1993, providing a major source of employment, foreign exchange earnings, and growth. Tourist arrivals have rebounded strongly following a dip after the 11 September 2001 attacks. The island experiences only a brief low season, and hotel occupancy in 2004 averaged 80%, compared to 68% throughout the rest of the Caribbean. The government has made cutting the budget and trade deficits a high priority.